Beyond Antananarivo—Madagascar’s capital city—signs of urbanization give way to sprawling farms and sweeping grasslands. At the coastal city of Toliara to the south, after a full day’s journey, the road turns into tire-sucking sandy track that mainly serves cattle-drawn wooden carts. For seven more hours, travelers cross a desert marked with spiny trees, where the sun bakes everything to a dusty crisp. Finally, the Bay of Assassins appears, an oasis thrumming with life, fringed with lush evergreen mangroves. A mangrove forest is unlike any other. At low tide, the trees loom from exposed mud, balancing on woody, tangled roots like ballerinas en pointe; at high tide, cool seawater erases the dry world, transforming the scene into an underwater spectacle. Glassy shrimp hover, their legs flickering with movement. Tiny metallic fry shimmer past, while adults lurk in the shadows. Slim tree roots stick up like pencils poked into the forest floor. Hermit crabs shuffle along thicker, oyster-encrusted roots that loop down through the water. Scattered around the bay’s 40-kilometer shoreline, 10 subsistence communities also rely on the mangroves’ offerings: from food, fuel, and building materials to erosion control and shelter for the young fish that will grow up to stock fisheries. “People go into the mangroves every day,” says Viviany, a young woman wearing a T-shirt, sarong, and golden hoop earrings, her face smeared in a crumbling clay paste to block the sun. She sits on a wooden bench in her family’s home in Vatoavo village, on the shore of the bay. People bustle around her, many of them using the mangroves. Women crouch next to crackling fires made with mangrove wood. People use nets to sift for shrimp in the saltwater creeks that trickle through the forest, and then pile their catch in the sun to dry. Young men stand up to their waists in deeper channels, angling with simple lines. Older women gather hermit crabs at low tide from the sand farther into the mangroves, methodically smashing the shells against a stone anvil, pinching off the head and claws. Some villagers have built their huts right on the shore, others farther back in the dense mangroves, but all are built with mangrove timber and fenced off with rows of mangrove saplings. Like the rest of the bay’s 3,000-odd residents, Vatoavo’s villagers are poor and very isolated. Their needs are modest. When they take mangrove trees, they usually take small and medium ones, leaving the largest. They log selectively, so the forest appears largely intact. These mangroves have so far avoided the fate of other, more accessible, mangroves in the Caribbean, Southeast Asia, and Africa, where development of valuable coastal real estate—from aquaculture to big hotel developments to palm oil plantations—has destroyed the trees. But now pressure is rising even here. Despite the bay’s minimal infrastructure—electricity, healthcare, and education are scarce—villagers are looking to improve their lives, through projects such as carefully managed octopus fisheries, and seaweed and sea cucumber farms. Already the villagers are earning more money and enjoying a higher standard of living. However, as in so many coastal communities, this increasing prosperity is changing the delicate relationship between people and mangroves. Here in the bay, this change has resulted in a rather unusual new industry. People are using more of the biggest, oldest mangrove trees to turn seashells into house-reinforcing—and increasingly affordable—lime clay. In Lamboara village, on the northern shore of the Bay of Assassins, a man stands next to the kiln he’s building. He looks about 60 and wears a felt fedora with a ribbon band, ripped shorts, and a sweatshirt. The stout waist-high kiln is a rectangle bigger than a queen-sized bed, walled with a ring of mangrove trunks as thick as an elephant’s leg. They are cut from the larger, older trees in the surrounding forest. Hundreds of empty seashells are collected from the villagers’ catches or from the bay—cone shells, spiny murex, and other mollusks—and piled in the center. When the single-use kiln is ready, the whole lot is set alight—wood and shells together—and left to burn until all that’s left is a pile of ashes and the coveted white lime. Villagers like mangrove wood for limekilns because it’s dense and burns hot enough to fully cook the shells into lime. They use the oldest trees because large logs keep the fire going without refueling. The only alternative for kiln wood is harvesting terrestrial trees from the forests that lie beyond the fringes of the bay, a long journey by cattle-drawn cart. “One kiln will make 35 or 40 sacks of lime,” the man says. “When the wind is blowing away from the village, I will light it and it will burn for two days.” When this batch is done, he’ll scoop the lime into old rice sacks the size of large garbage bags. The exact amount of lime he’ll get depends on how well the kiln burns. Mixed with water and smeared on houses, the lime powder hardens like cement and strengthens dwellings against the frequent cyclones that blow through the bay. Rendering a whole house takes at least 70 sacks. The only comparable reinforcement is costly cement that must be bought and carried in from Toliara. The man plans to use this batch to repair his house, which he says he built when his eldest son was knee-high; now his son has children of his own. He says his house was probably one of the first in Lamboara to be built using lime, suggesting the practice is about a generation old. “Lime production is not traditional at all,” says Lalao Aigrette, who works with an NGO called Blue Ventures. Aigrette lives in Toliara, working full-time on marine conservation projects in the bay that focus on protecting and preserving the mangroves. Aigrette says villagers have been cooking lime for fewer than 20 years, and its popularity has waxed and waned. Now she thinks that as incomes increase, boosted by other fishing and farming activities in the bay, people will want lime-strengthened houses, creating a market for local lime. Exactly how much demand has gone up remains unclear, but Aigrette sees reason enough to be worried. Back near Vatoavo village, a few minutes’ walk into the mangroves ends in a dramatic illustration of the impact villagers’ desire for lime is starting to have on the forests. A clear-cut area several hundred meters wide, the size of an average city block, has no living mangrove trees, no green canopy, and no seedlings; just sun-drenched mud dotted with silvery stumps. The ground here has slumped by at least 60 centimeters—an arm’s length—without mangrove roots to bind and hold the soil. These physical changes could stop seedlings from taking hold and prevent the forest from regenerating. “This is all for lime,” Aigrette says, surveying the cleared area. She recalls that this swath was cut two years ago to supply a big local lime order. Demand for lime is extending beyond homes in the bay. Aigrette recalls a priest from Andalambezo, a village about three kilometers south of the bay, who ordered tonnes of lime to build a school. Her colleagues went to talk with him. “He said, ‘This is for your children,’” Aigrette says. The priest reasoned that without a good education, children would likely become the mangrove cutters of the future, perhaps because they would have fewer options for making a living and may be less informed about the importance of intact mangroves. Sacrificing trees now for education that may help secure the forests’ future may seem like a contradiction. 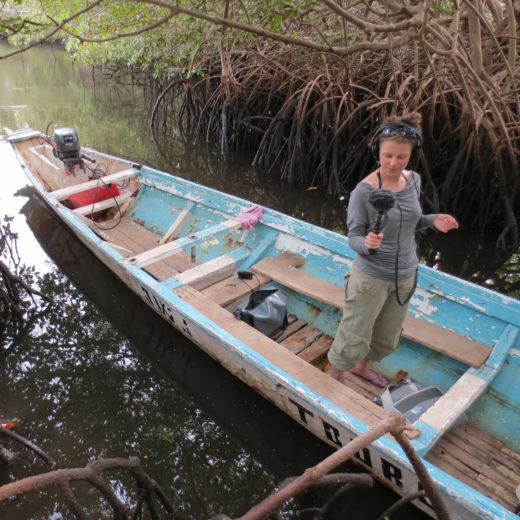 The answer, Aigrette believes, is balancing mangrove use and sustainable management. Around the city of Ambanja, 1,000 kilometers north of the bay, the practice of charcoal making offers a cautionary tale for the bay’s villagers. To make charcoal, wood is slowly baked in kilns; in Madagascar, these look similar to limekilns, except with wood instead of shells in their bellies. People prefer mangrove charcoal for their cook fires, partly because it burns hotter and produces less smoke—the same reasons it makes a great limekiln. Aigrette has seen whole areas cleared of mangroves around Ambanja because of demand for charcoal from urban populations. It’s part of a larger pattern; people have destroyed at least a quarter of mangrove forests around the world in the past 35 years, a rate of loss three to five times higher than deforestation on land. How this will end in the Bay of Assassins remains to be seen. The loss of mangroves around the world, has, paradoxically, given the villagers several advantages: foresight and growing scientific knowledge of mangroves’ value. In addition to vital resources and striking biodiversity, mangroves provide valuable ecosystem services, such as sequestering carbon. Aigrette and Blue Ventures are working with some of the bay’s residents on a so-called “blue carbon” initiative, whereby villagers would receive payments from the international carbon market in return for protecting and replanting mangroves in the bay. But the project is still in the assessment stage. For now, mangroves continue to provide for the inhabitants of the Bay of Assassins and life goes on. Back in Lamboara, the sound of chopping comes from the low canopy of a mangrove tree not far from the limekiln. A few moments later, a boy jumps down into the shallow water below, gathers an armful of branches, and begins the short walk back home to light a fire and feed his family. Dr. Helen Scales is a freelance science writer, documentary-maker, and marine biologist based in Cambridge, England. Her stories about the ocean have appeared in the Guardian, BBC Wildlife Magazine, Natural History Magazine, and National Geographic News. Among her BBC radio documentaries, she’s explored the enduring dreams of living underwater and of conquering the waves. Her latest book, Spirals in Time, examines the secret life and curious afterlife of seashells. Cite this Article: Helen Scales “A Burning Problem For Mangroves,” Hakai Magazine, Oct 11, 2016, accessed April 26th, 2019, https://www.hakaimagazine.com/features/burning-problem-mangroves/. Dams are leaving mangroves dangerously short on dirt. Long before texts or email, sailors sent messages using rocks. Yes, rocks.